Last week there was a spoiler about several Dharma Stations being located across the world. Many of you have speculated about the potential locations of these World stations including locations like Portland, Tunisia, and Australia. Well today, as many suspected, E! 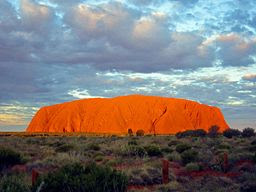 Online’s Kristin has confirmed that Ayers Rock aka Uluru in Australia is where one of the Dharma Stations is located. So what other locations will also have Dharma Stations!? This entry was posted in Uncategorized and tagged Dharma, Kristin, Season 5, Uluru by admin. Bookmark the permalink.